An iPad debacle that derailed a superintendent's tenure. A guilty plea from a former food services director accused of skimming from the budget. A financial scandal involving now-former school board member Ref Rodriguez and a charter school he founded. As LAUSD's official watchdog, the Office of the Inspector General had a hand in all of these cases, and many more. The auditors and investigators in the OIG are charged with holding LAUSD officials accountable for how they spend more than $9.6 billion each year. 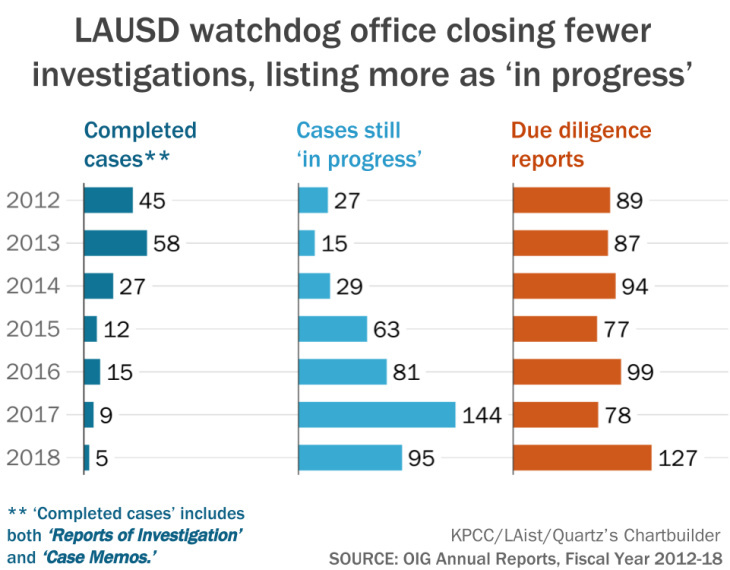 But in recent years, the OIG reported a sharp drop in the number of cases its investigative unit completed, according to a KPCC/LAist review of the office's annual reports. In 2013, the year Ken Bramlett was hired as LAUSD's Inspector General, the office closed 58 investigations. In 2014, the year Frank Cabibi was brought aboard as a deputy IG in charge of the investigative team, the OIG closed 27 cases. Five years later, in fiscal year 2018, the office reported closing just five full-fledged investigations. Meanwhile, pending cases piled up. Last year, the OIG reported 95 cases "still in progress" up from just 15 in 2013. KPCC/LAist learned of concerns about how the office is handling cases from a trove of documents OIG employees sent to higher authorities within LAUSD or in state government describing allegations that Cabibi and Bramlett oversaw a hostile work environment in OIG. In two of these documents, OIG employees also alleged Cabibi's handling of cases was causing a backlog. Three well-placed sources, one of them a fired OIG investigator, say cases were held open longer than they needed to be under Cabibi's leadership. Why? They say Cabibi was eager to open cases, but not to close them. A fourth source acknowledged some cases stayed open longer than they should have, but stressed that investigators were stretched thin and struggled to keep up with the workload. The question is not only whether OIG's investigators are getting their work done. At issue is whether the office has too much discretion to open new cases — or, conversely, whether investigators have too little power and too few resources to vigorously pursue investigations into corrosive waste, fraud or mismanagement. The issue has played a role in LAUSD's debates over charter schools in recent years. Charter advocates have criticized district officials for relying on OIG investigators too often to handle routine charter school oversight. The OIG is also tasked with completing routine background investigations on applicants who seek to open charter schools, take high-level jobs, or win contracts with LAUSD. In fiscal year 2018, OIG completed more than 127 of these "due diligence reports" — an increase of 60 percent from the year before. Nearly half of those reports were classified as "charter school due diligence." KPCC/LAist's reporting describing the tumult at the top of the Office of the Inspector General has opened a window into a secretive department whose leaders generally work behind closed doors and avoid press attention. Bramlett left the OIG in June 2018 and declined to comment to KPCC/LAist. Cabibi resigned in March 2018 amid sexual harassment allegations. He has said his resignation was unrelated to those complaints. Cabibi did not return multiple calls and requests for comment. Cabibi is on the record in court documents, however, saying he was trying to change how the office handled investigations to prevent disorganization and confusion when cases were forwarded to prosecutors. William Stern, LAUSD's new Inspector General, cautioned against drawing conclusions from the case closure numbers alone. Stern, who took over in January, declined to answer questions about specific cases or allegations of misconduct in how they were handled. Stern did offer a more general defense of how the OIG operates, noting that while some investigations can be straightforward and easy to close, a more complex inquiry might remain "in progress" for months — or perhaps longer. Maribeth Vander Weele, the former inspector general for Chicago Public Schools, agreed that it's difficult to definitively say what the numbers mean. But unlike Stern, Vander Weele said the decline in the number of resolved cases is notable. "Those numbers," she said, "seem to reflect the turmoil in leadership." The OIG's annual reports show that in a typical year, the office's investigative team fielded between 200 and 300 calls on its tipline, "most of which required some level of investigative follow-up." There is one exception: a relatively large number of calls to LAUSD's fraud hotline in 2017 triggered an unusually high number of investigations. Annual reports show that the inflow of work to the OIG has remained relatively steady, aside from that uptick in 2017. Yet OIG's own reports show the completed investigations have dropped to a fraction of what it was in June 2013, two months before Bramlett started in OIG. The number of incomplete investigations has also increased. In June 2014 — one month after Cabibi joined the office — there were 29 cases "in progress." One year later, there were twice as many. By June 2017, there were nearly five times as many open cases as there were three years earlier, when Cabibi came onboard. 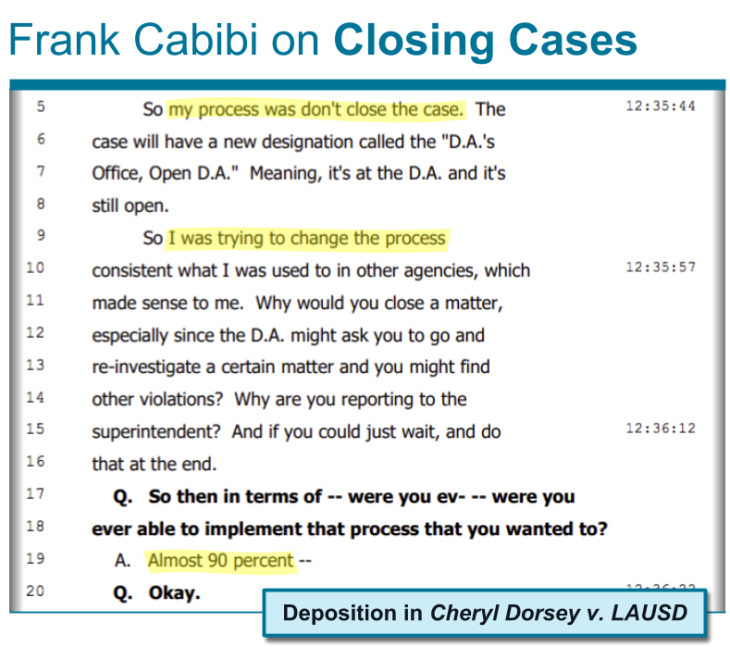 After Cabibi resigned in March, OIG staffers went through a credenza in Cabibi's office and found at least 25 cases ready to close, according to an email an OIG employee sent to LAUSD school board members. Contact the author of this article by email or via a Twitter message. 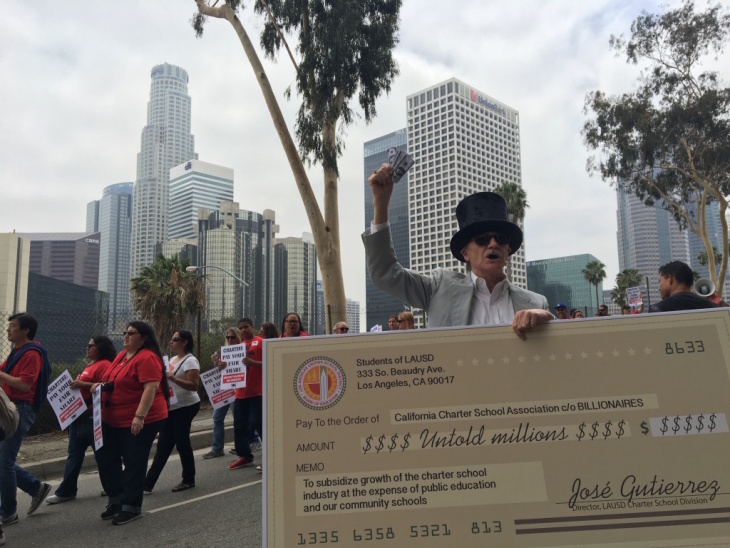 Advocates for charter schools have criticized LAUSD leaders for leaning on the Inspector General to perform routine oversight. Charter schools are publicly funded, but operated by outside non-profit organizations. Their opponents see them as a threat to the district's finances. However, charters are subject to oversight from LAUSD officials — including the OIG. In 2017, several prominent charter school organizations mounted another challenge to the OIG's authority, demanding LAUSD more clearly define when OIG could launch an investigation. After LAUSD officials threatened not to renew their schools, the charter groups ultimately backed off this demand. Some sources disagreed with the premise that the OIG was aggressively pursuing charter investigations and say that under Bramlett and Cabibi, investigators working charter school cases did not always feel they had free reign. Former OIG investigator Walter Finnigan said Bramlett and Cabibi's message to those working certain charter cases was: Don't do too much. Two other well-placed sources echoed Finnigan's description of Bramlett or Cabibi as hesitant to vigorously pursue certain cases involving charter schools. WHY SO MANY OPEN CASES? The volume of open cases could be tied, at least in part, with how Cabibi wanted to manage the investigative team. Cabibi himself has said he wanted to change how the office handled investigations, according to a sworn deposition he gave in April 2018 as part of yet another lawsuit, filed by ex-OIG investigator Cheryl Dorsey. Those changes had to do with when his office designated a case as "closed," particularly when their investigation might have resulted in criminal charges. LAUSD's Inspector General does not have the power to pursue criminal charges, but can refer cases to agencies that do, like the District Attorney or U.S. Attorney. In his deposition testimony, Cabibi explained he thought it didn't make sense to call such a case "closed" when "the greater case was the ... potential criminal case." "So my process was: don't close the case," Cabibi said. "The case will have a new designation called 'the D.A. 's Office, Open D.A.' — meaning it's at the D.A. and it's still open." The annual reports KPCC/LAist reviewed do not show how many OIG investigations, if any, were designated as "Open D.A." One possible reason for that, which is noted in the reports, is that state statute limits the OIG's ability to disclose the results of its investigations. That said, Finnigan, who worked for the OIG for three years, said he believed only a handful of the open cases could be designated as pending with the D.A. 's office. Finnigan and another well-placed source said they believed Cabibi had another reason for keeping cases open: to leverage more resources for the office — a greater budget, more investigators, or maybe both. "I believe [Cabibi] was trying to pump up the caseloads," Finnigan said in an interview with KPCC/LAist. In his deposition, Cabibi acknowledged tensions between him and board members. Though he didn't specify the source of the tension, Cabibi said he decided that he "didn't like the politics ... of the board." "I felt certain pressures that— I felt that the direction I was taking the program," Cabibi said, "was not in the same direction that the board wanted the program to be in." LAUSD fired Finnigan in December 2018 after a co-worker accused him of sexual harassment. As KPCC/LAist reported last week, Finnigan denies all allegations of wrongdoing. His wrongful termination suit against LAUSD claims the district's reason for his firing is "pretextual," and that he was actually terminated in retaliation for speaking up about "illegal misconduct" inside LAUSD. The case is still pending. In a statement, LAUSD said Finnigan's lawsuit was "filled with inaccurate allegations." What do we know about the types of cases OIG takes on and what it takes to close them? Stern, LAUSD's current Inspector General, said some instances of fraud or waste are "easily identified and worked to conclusion." Then, he said, there are cases that are "very complex and sophisticated schemes and artifices to defraud that can take a substantial number of resources." Pursuing those complex cases can take time. For example, in 2014, OIG auditors first published a report raising red flags about David Binkle, the former leader of LAUSD's Food Services Division. After the OIG's review caught the attention of the District Attorney, the case took almost five years to wind through the criminal courts. It was only this month that Binkle pleaded guilty to felony conflict-of-interest and forgery charges. In the annual report, both a complex case and a relatively straightforward case count as the same. "It's important to look at the type of investigation and not just the quantity," Stern said, "especially in an office that is charged with such a broad and large mission." Vander Weele, the former Chicago schools IG, said there are reasons to be concerned about the trends in case closures at LAUSD's OIG. Yes, she says, fluctuations can happen from year to year. But she said LAUSD's numbers show a precipitous drop, not a small fluctuation. For example, Vander Weele pointed to the June 2017 figures, which showed OIG — which has "around a dozen" investigators — had closed just nine investigations over the previous year. "One investigator," she said, "should be able to close nine cases."